County of Gloucester: Aldsworth, Aston Black, Bibury, Chedworth, Coln Rogers, Coln St Aldwyn, Coln St Dennis, Compton Abdale, Dowdeswell, Eastington, Eastleach Martin, Eastleach Turville, Farmington, Hampnett, Hasleton, Little Barrington, Northleach (2), Salperton, Sevenhampton, Sherborne, Shipton Oliffe, Shipton Solars, Southrop, Stowell, Turkdean, Winson, Whittington, Windrush, Withington, Yanworth. The population falling within the Union at the 1831 census had been 10,019 with parishes ranging in size from Howell (population 43) to Chedworth (1,026) and Northleach itself (795). The average annual poor-rate expenditure for the period 1833-35 had been £6,066 or 12s.1d. per head of the population. 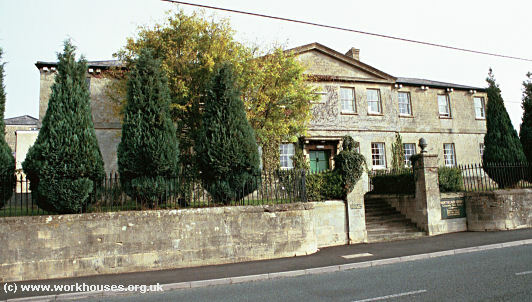 The new Northleach Union workhouse was built at the east end of Northleach in 1836. The Poor Law Commissioners authorised an expenditure of £3,650 on construction of the building which was intended to accommodate up to 200 inmates. It was designed by George Wilkinson who was the architect of many other Union workhouses including nearby ones at Witney, Chipping Norton and Stow on the Wold. His design for Northleach was a cut down version of the model square plan published by the Commissioners in 1835. The workhouse location and layout are shown on the 1887 map below. The workhouse had an entrance block at the south which would have contained a porter's room and the Guardians' board room. At the rear, four accommodation wings for the various classes of inmates (infirm/able-bodied, male/female etc.) radiated from a central supervisory hub. The areas between the wings formed segregated exercise yards. 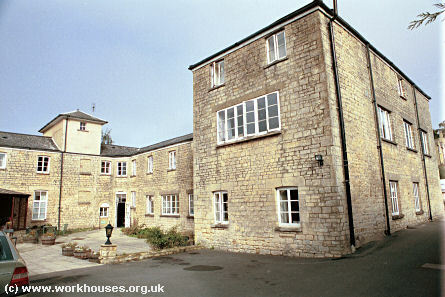 Northleach workhouse from the south-west, early 20th century. Northleach entrance block from the south, 2000. Above the front entrance is a date plaque, probably dating from the 1920s when the workhouse was officially known as Northleach Poor Law Institution. Northleach entrance date plaque, 2000. Northleach general view from the north-west, 2000. Northleach east wing from the south-east, 2000. A chapel was erected at the south-west of the workhouse in the late nineteenth century. Northleach chapel (right) from the south-west, 2000. 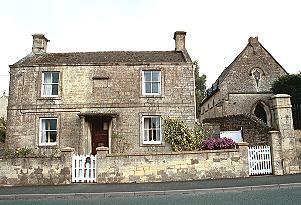 A casual ward for vagrants was located adjacent to the police station at the north-west of Northleach. 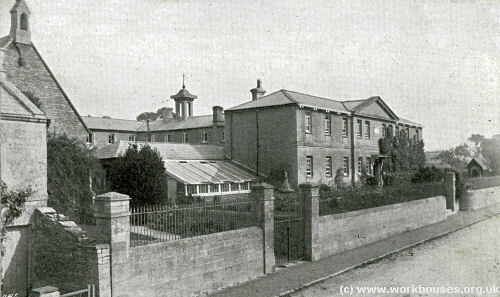 The former workhouse later became Northleach hospital. It is now used as a care home for the elderly. Gloucestershire Archives, Clarence Row, Alvin Street, Gloucester GL1 3DW. Few records survive —; holdings include Guardians' minute books (1875-1937); Ledgers (1870-1911); etc.